Energy saving is the main issue in this era. At town and city level Street Lights consumes very high electrical energy per minutes. Design base lighting as per road size & traffic conditions. Automation in street lighting systems. 4 Power redundancy for controller. 6 Auto / Manual facility for emergency operation. 12 Saves Energy by changing on and off time Daily. 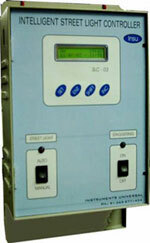 16 GSM based controlling & monitoring . 17 Efficient Service X X X X Sure.